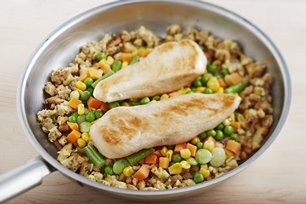 Got chicken breasts, stuffing mix and frozen mixed veggies? Then you've got what it takes to make this 25-minute skillet. Heat oil in large nonstick skillet on medium heat. Add chicken; cook 5 min. on each side or until lightly browned on both sides. Remove chicken from skillet; cover to keep warm. Add broth to skillet. Add stuffing mix; stir just until moistened. Top with vegetables and chicken; cover. Cook on low heat 10 min. or until chicken is done (165ºF) and vegetables are heated through. If you use boneless skinless chicken breasts often in recipes, package them for the freezer in recipe-size portions. This lets you thaw only the amount you need. Store remaining stuffing mix in airtight container at room temperature. Use to prepare remaining stuffing mix as directed on package, using half each of both the water and non-hydrogenated margarine listed in directions.